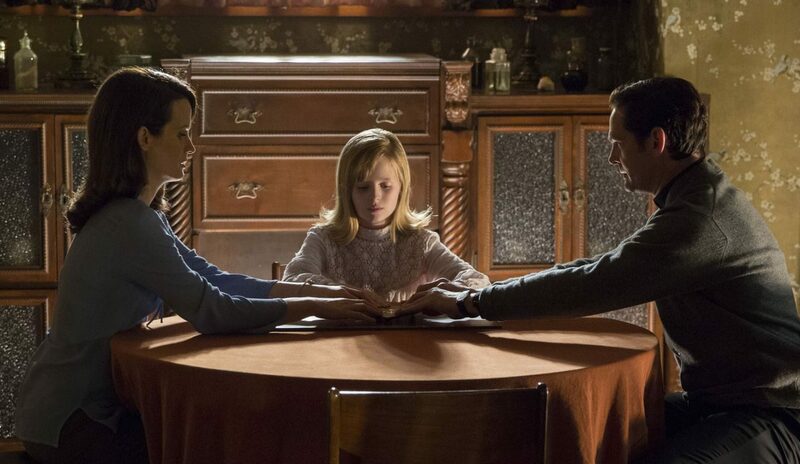 Whatever else may be haunting the unconvincing horror prequel “Ouija: Origin of Evil” (Universal), a slavish devotion to logic is not its characteristic specter. In generating a forerunner to 2014’s “Ouija,” director and co-writer (with Jeff Howard) Mike Flanagan shows commendable restraint in keeping the blood flow to a minimum. He and Howard also include in their cast of characters that rarest of Hollywood figures, a sympathetic Catholic priest. Neither the presence of the amiable clergyman nor a judicious approach to otherworldly mayhem can compensate for the increasingly nonsensical behavior on screen. But the latter feature does at least suggest that this installment of the franchise may possibly be acceptable for older teens. In 1967 Los Angeles, middle-aged widow Alice Zander (Elizabeth Reaser) earns her living as a bogus medium. She’s aided in her charades by her two daughters, 15-year-old Lina (Annalise Basso) and 9-year-old Doris (Lulu Wilson). In the first example of the film’s ambivalent approach both to the occult and to religion, Alice justifies her fakery by claiming that her seances help her clients find comfort and closure. Somewhat ironically, those are feelings she and the girls have yet to experience for themselves in the wake of husband and dad Roger’s recent — and obviously premature — demise. At Lina’s suggestion, Alice buys a Ouija board as a new prop for the act. Said fateful purchase is, of course, the cue for all …H… E… C… K… to break loose. As with its predecessor, the movie amounts to extended, though rather paradoxical, product placement for the Hasbro “game” version of the device. Sooner than you can spell out exorcism with a roving planchette, little Doris has been possessed by a dark spirit. Perhaps the girls’ principal, Father Tom (Henry Thomas), can help with that? He’s certainly concerned about the family, as he demonstrates during another of the movie’s equivocal sequences, a potentially romantic dinner he and Alice share at a dimly-lit restaurant. Perhaps because lifelong celibacy is too weird a concept for contemporary audiences to wrap their minds around, the script informs us that Father Tom is a widower. The neighborhood eatery at which he meets Alice, ostensibly to talk about what’s troubling her kids, is not only an old haunt of his and his late wife’s, it was also frequented by Alice and Roger. Though the cleric and the sham clairvoyant share an obvious mutual attraction, it’s all left at the level of an abstraction. Refreshingly, Father Tom is committed to his vocation, and has kept things on the up-and-up from the start by wearing his clerical collar to the meal. But respectability does not equate to spiritual power, as Father Tom discovers once he tries to aid the embattled clan. The closest he gets to any ritual approach to the problem is a half-hearted “Our Father.” But the demon is having none of it, and assaults him in mid-sentence. By then, he has at least helped Alice and Lina figure out the back story behind it all. This turns out to be a muddled historical mishmash and, as things heat up, credibility melts away still further. Early on, we’re shown that Lina is going through a rebellious phase when she sneaks out of the house at night and attends a liquor-enlivened party. But she and her friends — including her soon-to-be love interest, Mikey (Parker Mack) — are caught, and she’s appropriately reprimanded by Mom. Later, Lina smuggles Mikey into the house while mom is out. Though the two go upstairs to her bedroom, their illicit behavior there extends no further than a kiss, after which Mikey departs with a contented smile on his face. A much larger concern than these relatively venial transgressions is the potential for adolescent viewers to want to dabble with a Ouija board in real life. It’s a well-established fact that such seemingly innocent interaction with what purports, essentially, to be a toy or a pastime can lead to spiritually disastrous results. So if there’s the slightest possibility that the movie, which may be said to wink at its own plot, would attract a youngster to experiment with this dangerous apparatus, parents should exercise an immediate veto. The film contains occasional violence with slight gore, occult themes, underage drinking, an instance of mild irreverence, at least one use of profanity as well as a single crude and a couple of crass terms. The Catholic News Service classification is A-III — adults. The Motion Picture Association of America rating is PG-13 — parents strongly cautioned. Some material may be inappropriate for children under 13.